A good travel rewards credit card is worth its weight in gold. 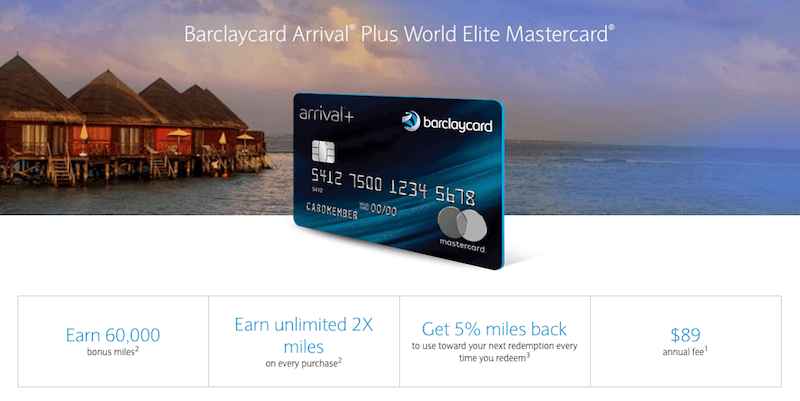 And, while there’s certainly a lot of competition among other top-rated rewards cards, the Barclaycard Arrival® Plus World Elite Mastercard® remains a favorite because of its high rewards rate, flexible reward options, and awesome sign-up bonus. 1. It has an awesome sign-up bonus. You’ll earn 70,000 bonus miles when you spend $5,000 within the first 90 days of opening an account. 2. The rewards add up fast. You’ll earn 2x miles for every dollar you spend. 3. Your rewards keep on giving. When you redeem your rewards, you’ll get a 5% miles rebate to use the next time (hard not to love that). 4. Reward options are super flexible. You’ll be able to redeem rewards on nearly any travel purchase, including airfare, hotels, cruises, and more in the form of a travel statement credit. 5. Miles never expire. As long as your account is open, your reward miles will never expire. 6. No foreign transaction fees. So you can travel abroad without worrying about fees. » Click here to learn more and apply for the Barclaycard Arrival Plus® World Elite Mastercard® today! When it comes to booking a trip, flexibility is key. Luckily, the Barclaycard Arrival® Plus World Elite Mastercard® has you covered with super flexible reward redemptions. Once you’re ready to redeem, rewards can be booked however you’d like – whether that be directly through an airline or hotel, travel agent, or travel website. The Barclaycard Arrival Plus will then reimburse your travel expenses with the reward miles in your account. This option is especially beneficial for budget travelers since it allows you to snag the best deals whenever they become available. Reimbursement Example 1: Let’s say JetBlue has an incredible sale on airfare and you quickly book a $100 roundtrip ticket to San Diego using your Barclaycard Arrival Plus. Once the purchase shows on your statement, you would simply select and submit the expense for reimbursement using your miles; when the transaction clears, you’ll be jetting off to San Diego for free thanks to your rewards. Reimbursement Example 2: If you’re planning a trip with a group of friends and making reservations through a travel agent, you can use your miles to be reimbursed once the trip is booked. After using your Barclaycard Arrival Plus to pay for your travel reservations, you would simply log into your account, pull up your statement, and tag the expense for reimbursement. Once it’s been processed, you’ll see a credit on your statement for the amount covered by your reward miles. A generous sign-up bonus is always a factor when searching for a travel rewards credit card and the Barclaycard Arrival® Plus World Elite Mastercard® doesn’t disappoint. You’ll earn 70,000 bonus miles after you spend $5,000 on purchases within the first 90 days of opening an account. To put that into perspective, 70,000 miles is enough to redeem over $600 in travel statement credits! Building a stockpile of rewards with this card is easy – you’ll earn 2 miles for every dollar spent on this card! Most credit card reward rates are 1%, so this high rate of rewards is a keeper. Each mile is worth 1 cent, and when you redeem them, you’ll get 5% back to use towards your next redemption. This essentially means you'll never run out of miles. Using the Barclays mobile app, you can instantly secure your accounts by locking your card through Barclays SecurHold protection — a huge relief if you think your card's been compromised. As with all rewards credit cards, worrying about blackout dates, mileage caps, and reward expirations are common. However, you won’t need to worry about that with the Barclaycard Arrival Plus. There’s no cap on the number of award miles you can earn, no blackout dates, and as long as your account is open, miles never expire. Another great redemption tip is you can redeem miles for your entire trip or just a portion - you decide what’s best for you. This card carries no foreign transaction fee, making it a must-have for traveling abroad. Also, it’s chip-enabled and PIN capabilities make it a secure choice to use while traveling abroad. One of the reasons we love this card is because of the emphasis on customer experience. When you sign-up for the card, you not only receive a powerful travel rewards card, but you also gain access to the Barclaycard Travel Community which connects travelers across the globe and rewards them with bonus miles for sharing their travel stories. As good as this rewards card is, you may want to consider a different option if you fall into one of the categories below. A high rewards rate is only good if it fits your lifestyle, so if traveling isn’t really your thing and you’d prefer a cash back rewards card, the Chase Freedom Unlimited Card may be better for you. You’ll earn 1.5% cash back on every purchase, and there are no limits to the amount you can earn. Plus, there's no annual fee, and you can earn a $150 cash back bonus after spending $500 on your new Card within the first 3 months. Belonging to an airline loyalty program isn’t a deal breaker for getting the Barclaycard Arrival Plus® World Elite Mastercard® by any means, but if you’re able to get more value out of reward miles or points through a loyalty program, you may be better off with a card like the Chase Sapphire Preferred instead. This card allows you to transfer points to several major travel programs at a 1:1 ratio, which if you’re skilled at stretching rewards, could mean squeezing as much as 5 cents out of each point. If you typically stick with domestic travel, the Capital One Venture Rewards Card may be a better match for you. With a similar sign-up bonus and earning structure, the Venture Rewards Card features chip-and-signature technology (vs. chip and PIN) which is standard all around the U.S. and has a lower annual fee. If you’re looking for a rewards card to serve as a powerful travel companion around the globe, the Barclaycard Arrival® Plus World Elite Mastercard® is a solid choice. With so many incredible benefits and a ton of flexibility, you’ll be booking for your first rewards trip in no time.